I have just come home from Canada, having spent the 2016/17 winter season living and working as a kids ski instructor. This is a brief insight into a day in the life of a ski instructor at Whistler Kids. I usually get up for work around 6.45/7am, trying to beat the other flatmates to the shower first! Then I put on my ski uniform and have breakfast. I always had either peanut butter toast or muesli (you need slow release food when skiing) and ready to leave for work around 7.45am. The commute to work varies for where you are located, but always requires a ski down to your base. Commuting by ski is a fun way to live! I aimed to arrive at 8.00am sharp. When arrived there is a morning meeting to discuss the snow conditions, lunch options, group levels and any fun events coming up that week. Afterwards I set up the kid’s area, cut up some fruit snacks and prepared for the day. 8.45/9am kids arrive! Per group a maximum of 4 kids with minis and 6 kids with juniors/supers (6-12 y/o) is allowed. I introduce myself and write down their names, ask where they’re from and entertain them with toys and colouring to break the ice. This is sometimes a child’s first time skiing or first time away from mum and dad, so it can be scary. “No Pee, No Ski” is a phrase you learn to always say to your kids, where you make sure they go to the toilet before skiing; to lessen the chance of an accident on the mountain! Now the skiing begins! Everyone is enthusiastic and we play games and exercises to learn or improve their skiing. Games included ‘Red Light Green Light’ to help learn snowplough or ‘pizza’ and ‘Winnie the Pooh, Scooby Doo’ to aid sidestepping up a hill. These games made the experience more fun and exciting for their age group. 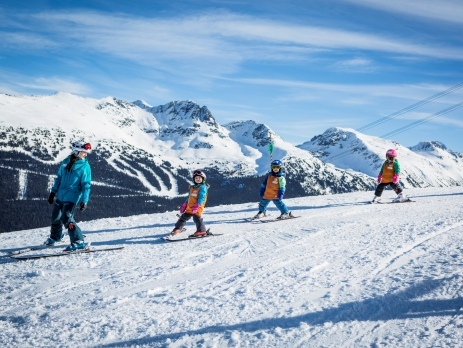 Most minis instructors are on the nursery slope or ‘Magic Carpet’ but if my class seemed able and willing to do harder terrain we would go up the chairlifts like ‘Magic Chair’ or ‘Wizard’ on Blackcomb Mountain. By 11.30am it is time for lunch! The most popular option is grilled cheese for the kids. However anyone can have meat and veggie meal options plus also soup, salad, fruit and desserts like jelly for the kids! During lunch you can entertain your group with Lego, colouring and reading stories to them. One of the best games I liked to play with the kids was ‘What’s the Time Mr. Wolf?’ because it involved running around and made everyone laugh. Around 12.30/1pm we head back outside to go skiing again. At roughly 2pm we go back inside for a hot chocolate and cookie break, which also gives you the chance to write each individual in your group’s performance cards. I would say what they can do really well, what needs improvement and what level they are for next time they ski at Whistler Kids. A useful tip I’d suggest is to add stickers to their cards and your name badge because it adds a more fun personal touch and both the kids and parents are happy and impressed! Parents pick up at 3pm, which makes all the kids very pleased to see Mum and Dad again. I’d talk to the parents about what we did during the day, where we went, what their child’s favourite part of the day was and recommendations for things to do in Whistler that evening. The active engagement with the parents can sometimes lead to a tip if you’re lucky. After work there are a number of things one can do. Usually after a long day you head home to relax for a while, however some have a post-work drink in a bar or go shopping. There is always something happening every evening in Whistler. 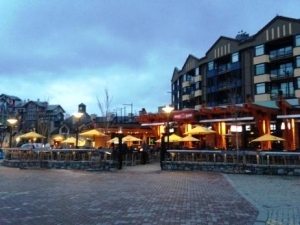 Thursday nights at Merlin’s are very popular with ski instructors, with dancing on the tables and live music from Whistler’s favourite band Red Chair, who play sing-a-long big anthems from Wonderwall to Under the Bridge. Make sure you get there early though as queues form quickly! If the night continues, Moe Joe’s, Garfinkel’s, GLC or Longhorns and many more clubbing haunts will follow, if you have the energy. To stock up on energy, you can head to the locals favourite Fat Tony’s or Avalanche for a slice of late-night pizza along the way ‘Beef and Blue’ is a renowned best-seller. Eventually you head back to staff housing and crawl into bed, ready to get up for work again the next day! 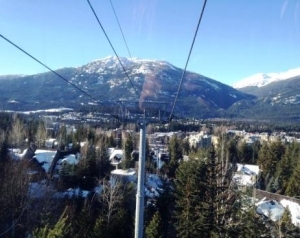 If this has whetted your appetite to experience a ski season in Whistler, then fill out a booking form and get on board, or e-mail the destination manager Jon for any questions and more information.